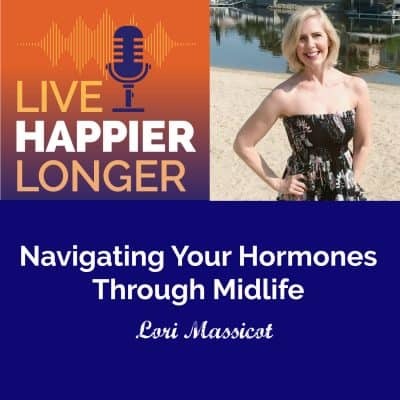 On this episode of the Live HAPPIER longer podcast, we visit with Lori Massicot. Lori is a Certified Nutrition Coach, Holistic Wellness Coach and Sober Coach. We talk about a lot of challenges surrounding the hormones of midlife and how they cause so many of us to gain weight. An easy first change we can make to improve ourselves, and that would be to focus on the food that we are eating. Start adding things, instead of taking things away. Add more water, vegetables, make some healthy swaps (crunchy apples vs. crunchy chips).